O Dock: Is God Trying To Tell Me Something? Is He leaving a mocking message in the comments page of my life? When I left for work the other day, something was not right. There was some kind of ruckus going on at the neighbors', but I couldn't tell quite what it was at first. The dogs were barking and there were fluttering sounds from the roof of the neighbors' garage. I looked up and saw this. 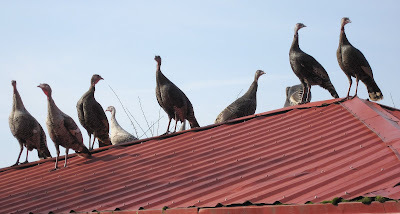 There were about 25 wild turkeys on the roof of the garage, where usually there are none. And they seemed to be eyeing me. And some of them were definitely laughing. Then, I looked around, and there were more turkeys in the yard. 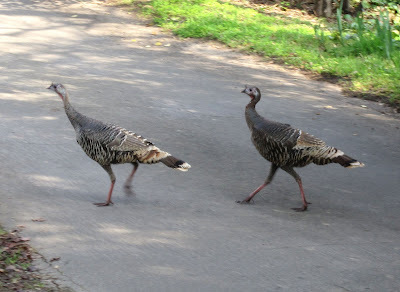 I was surrounded by turkeys, wherever I looked. What was the message here? 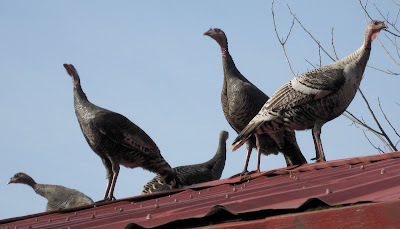 I was at a complete loss for the correct collective name for a group of turkeys, until I explained to my wife that the birds had been wandering around, unsure where to go, until the barking dogs panicked them and they all moved in a rush to the garage roof, where they were trapped without a plan for escape. She then remembered the word. Contrary to your wife's collective noun for them, you're fortunate in that they are not team players. Oh yeah, neither are the members of other sorts of committees. ... Nor are their ugly cousins, turkey vultures. I'm great. You? Not so much. Let the turkeys be a reminder. I'm trying to tell you to write some frigging sailing posts instead of all this bird-watching nonsense. lord god: some relatives of yours? Lord god may be British but I outrank him. Now write some frigging sailing posts. They must be having the annual Christmas vote somewhere near you. 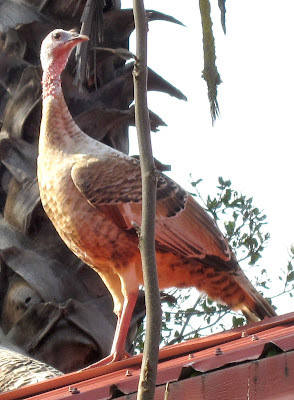 And then there was the Thanksgiving day a few years back that we had a turkey at Five O'Clock Somewhere who really, really seemed to be trying to get into the house. It was on the front porch, and it was so aggressive we couldn't even open the door. Seems it didn't realize one of its relatives was already in the oven. The latest fishing reports from Heron Lake have all run along the lines of "too much ice along the shore for fishing from the banks or launching boats; not enough ice for ice fishing; plenty of turkeys to watch." Hey, O'D, it's me again. Just want to check in on you and my creatures. Also, don't put much stock in those false gods. I'm the one true, you know. Don't let the peanut gallery gods sway you from the true path. Or I'll turn you into a pillar of salt, or maybe send some locusts to eat up your Flemish coils. God, thanks for stopping by again. There seems to be some kind of intellectual property rights thing going on with the 'god' branding. I certainly don't mean any disrespect, but there have been messages here from you, 'lord god', and 'god the king'. 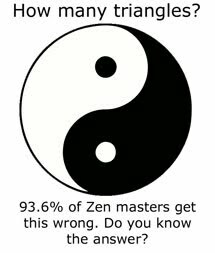 You did post first, so it's not like I've got any gods before you, but could you folks work this out? Maybe have your people get with my people? But, please, stop sending those dudes in the white shirts and black pants around on Sunday mornings. They're just annoying and they're really not helping your cause any. And oh, tell Tillerman I said, "Hi." You're so right, Carol Anne. The word 'congress' can have so many different meanings. I have Nine Billion Names so let's not get hung up on whether I am Lord or King or Whatever. Just write some frigging sailing post. And oh, tell Tillerman I said, "Hi." I haven't heard from him in a long long time.